We are proud of our achievements in helping our local community! 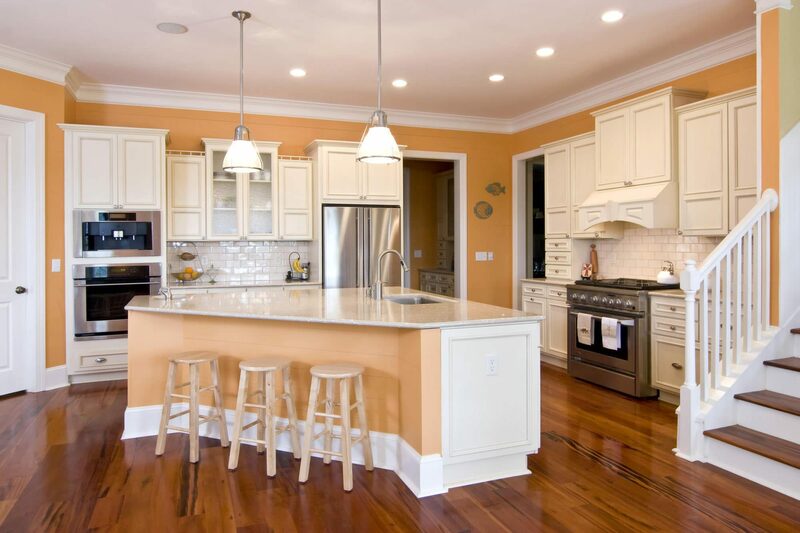 Sierra Remodeling & Home Builders is a Veteran owned business that has been remodeling and building custom homes since 1979. We have received many accolades over the years but, we are most proud of our achievements in earning your satisfaction and praise. We have received numerous industry awards as well. There are too many to list here, but these are some of the more recent recognitions we prize the most. We are absolutely ecstatic to receive these accolades. 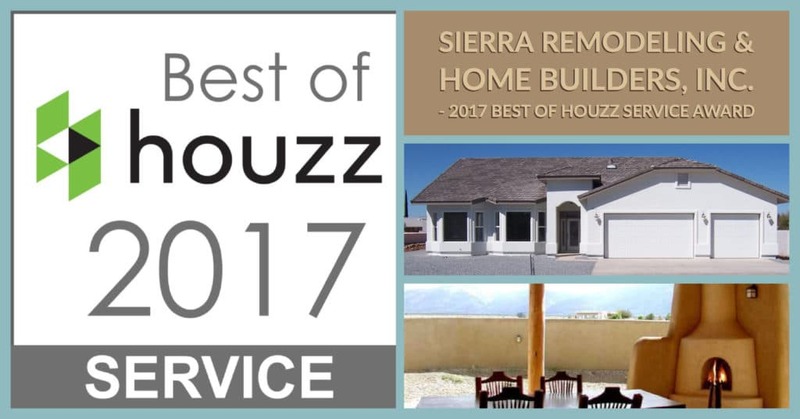 At Sierra Remodeling, we pride ourselves on providing the highest standards of service and design and so we are extremely grateful to the Houzz community for their continued recognition and support. To receive an award for customer service as determined by our clients is especially rewarding. We are delighted to receive the Best of Houzz 2017 Service award in recognition of our commitment to satisfying our customers. Re-Bath®, America’s largest bathroom remodeling franchise, honors its top franchises with awards each year. Awards were presented based on exceptional franchise performance and meeting the Re-Bath® Code of Values and sales system. 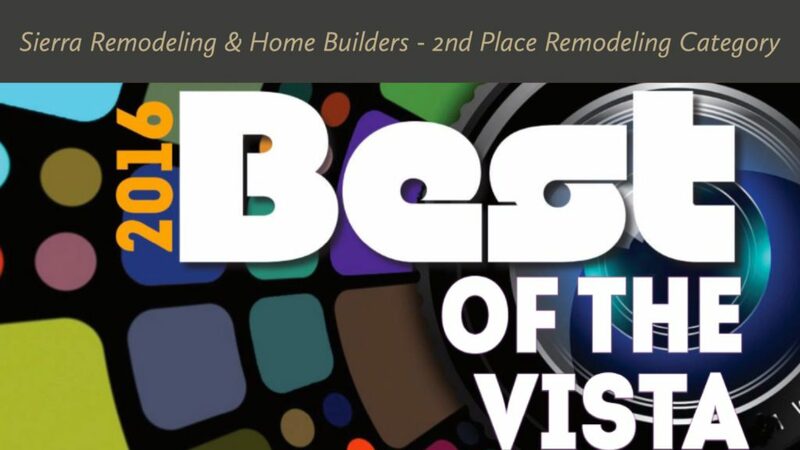 We are so honored to have received this award which reflects on our hard work and strong commitment to bathroom remodeling throughout the year. Each year the local newspaper, The Sierra Vista Herald, publishes the Best of The Vista which honors those Sierra Vista businesses held in the highest regard by the local residents who actually vote for their favorite merchants. We are especially proud of being recognized by our many faithful customers and home owners. Thank you! Each year, Angie’s List presents its Super Service Award to companies that have maintained a superior rating. 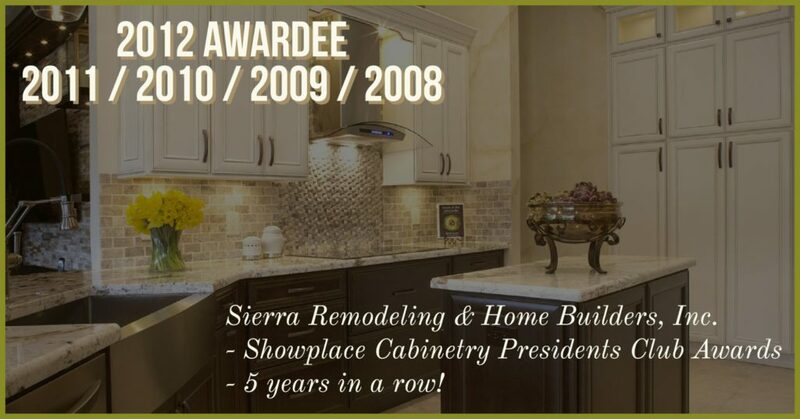 Sierra Remodeling & Home Builders has earned the 2013 Angie’s List Super Service Award in recognition of superior customer service. This recognition is awarded only to the top 5 percent of all companies rated on Angie’s List with an overall “A” rating and consistently high marks from subscribers. Because we take our business relationships seriously, receiving affirmation and mutual appreciation from Showplace Cabinetry means the world to us. 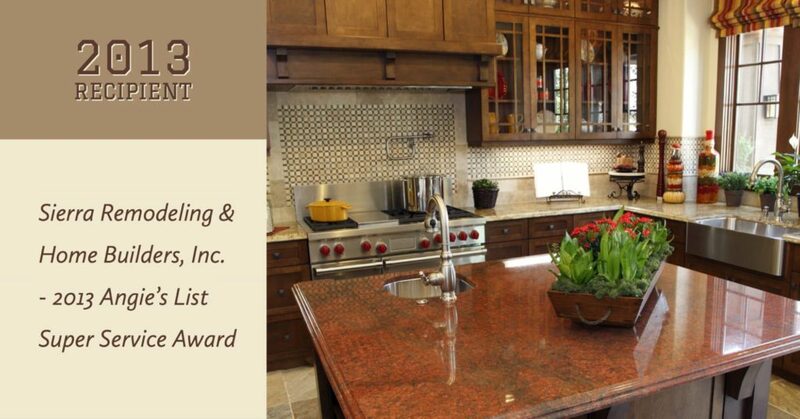 For the past five years, our friends at Showplace Cabinetry recognized our team with their national President’s Club Award for outstanding sales! It’s an honor to be counted among the top Showplace dealers nationwide – their beautifully crafted, American-made, cabinetry is easy to sell! Of course I wanted to write and say again what a fabulous job you did with our kitchen and bathroom(s) remodel! Both Charles and I greatly appreciate all the time, energy, attention to detail, follow up and follow through that you provided throughout the design process, purchasing of materials, and installation. The whole process went very smoothly because you were in constant communication with us and willing to address any issues at any time. Also, your interpersonal skills and humor made the remodel a much easier experience. All the guys (including Erv who helped us pick out the design elements one evening) that worked here at the house were very respectful, unobtrusive and hard working (Poncho, Ken and his son (the painters), Larry the cabinetmaker, both Gregs, Jeremy the marble installer, Larry and Dustin the electricians and Antoine. Arizona Tile and your local granite cutter were also great to work with. Carol was a joy to see and talk to over the phone. Most of all was the amazing speed at which the whole remodel was completed in just over a month. Charles and I will definitely use your services again and will continue to recommend your business to friends and family. Please forward this to Howard and thank him for us and the best to all of you.